Based off the weather forecast for the next 10 days, we are in for some warm weather. This is great for cookouts and outdoor activities and it’s certainly welcome based off the winter we had. However, managing turfgrass brings new challenges to our area. Lawns need to receive at least 1″ of water per week. 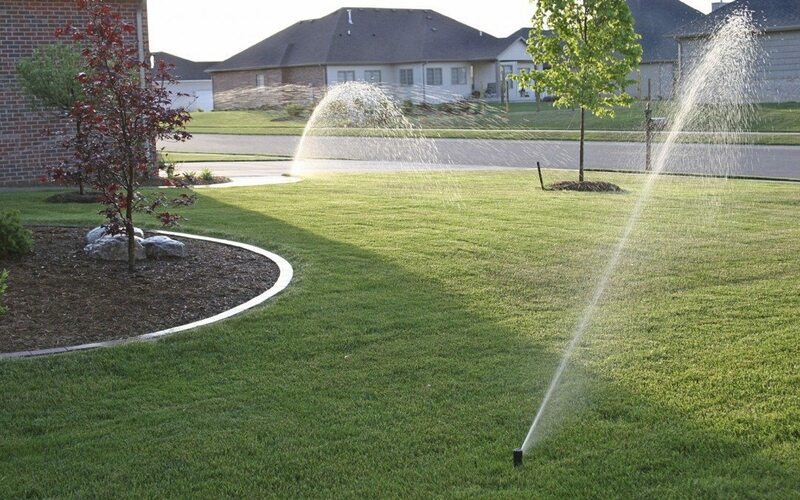 If you have an irrigation system installed in your lawn areas you have made things easy on yourself. If you don’t have one then you have your challenges to look forward too in order to keep your lawn healthy this summer. Lawns have been doing their best to recover from the winter root die back. We have had a great stretch of weather this spring and it has been good for rebuilding. It is important that you keep your eyes open as it relates to your lawns and ensure that regression doesn’t happen too much. It’s quite simple when you think about the depth of the root and how much you have to water. If you are consistently mowing at 2.5″ – 3″ in height or more you are ensuring that your turf roots are growing to a similar depth. The taller you mow the deeper the roots grow. With the high heat and scorching sun we have in the forecast, watering, timing and frequency is important. Make sure you water first thing in the morning. 4am – 8am is best. During the day and afternoon can permote fungus and also waste due to evaporation. When you water, you should water “infrequently” for established turf. This means you should water your lawn for at least 30 minutes in each spot. The good news is you shouldn’t do this every day or even every other day. You should water deeply and infrequently. This means 2 to 3 times per week at a max! Minimize leaf wetness. This will help keep fungus like red thread and others at bay. However, when we have high humidity it is ideal for fungus to spread. Ensure when you cut your grass you are doing so with a sharp mower blade. If you haven’t sharpened it yet this year now is a great time to get it done! If you have no means to water your lawn then your mowing practices should be utmost priority! If your lawn is turning brown and the soil is appearing to be dry then stop mowing! Let the grass grow naturally and allow the roots to spread deep as possible. You do this by allowing the lawn to grow taller than normal. 4″ is great! Remember the 1/3rd rule! Never remove more than 1/3rd of the leaf blade per cut. Example: If you mow constantly at 2″ let it grow to 3″ then cut it back down to 2″.. Or better yet let the grass grow to 4″ or so and then when you absolutely need to cut the grass make your cut at 3 – 3.5″. Having longer shoot growth will provide a cooling effect and also allow the soil surface to have more shade. This will help prevent rapid moisture loss. When you make your cut take a ruler and test the cut height by sticking it on the soil surface and measuring the average blade height. If the cut is too short RAISE YOUR MOWER DECK! These few tips will help prolong the nice green color in your lawn this summer. If at any time something doesn’t look right by all means say something to us. You can login to your account and request a visit if necessary. You can always email photos to us: comments@www.gtlawnservice.com You will receive a quicker response by emailing us. Especially if you can provide us a few photos of the area of concern. In many cases a site visit is not necessary. Being proactive about the health of your grassplants is the best way to ensure success this year. If you or your children become sick you normally wouldn’t let it go too long without getting help. The same standard should be applied to your lawn. After all we are here to help you. That’s what we do! Please contact me, as I need some help with my lawn. 207-236-2363. thank you. Happy to help Jerry! Please visit: https://www.gtlawnservice.com/contact-us/free_inspection/ and fill out the form.. We will schedule a site visit.